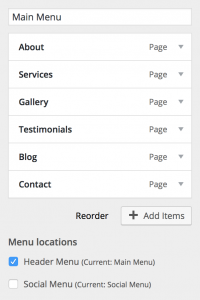 Your pages should already be displayed within the navigation menu on your site. However, they may not be in the order you desire. So, let’s create a custom menu! Header Menu (or “Main” Menu) — For displaying your main site navigation. 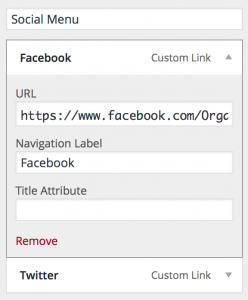 Social Menu — For adding links to your social networks. Click the “Add a Menu” button. Click the “Create Menu” button. Click the “Add Items” button. Add Pages to your menu. Drag the Pages into the order you desire. Check the “Header Menu” location. Click the blue “Save & Publish” button. 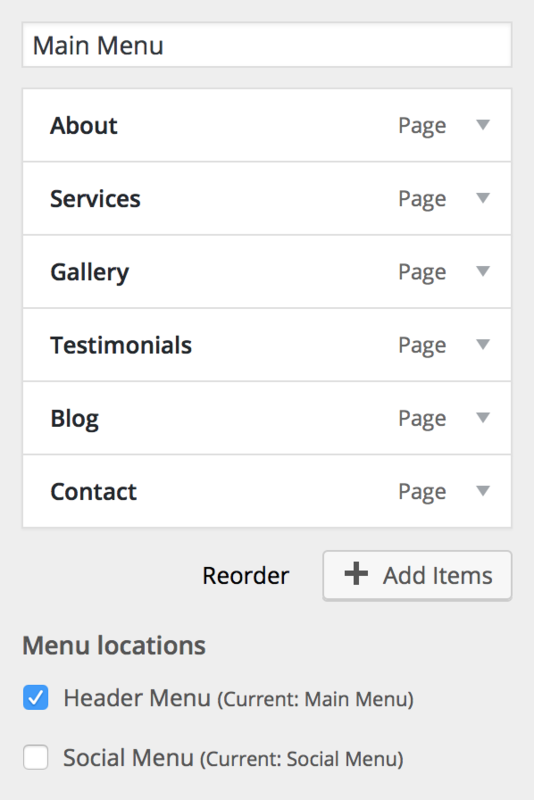 In addition to pages, you can add other items to you menu such as Categories and Custom Links. Your menu should look similar to the example image above. Note: To have social media links open pages in a new tab, select “Screen Options” and check the box that says “Link Target”. Then, within each social media tab (under the URL) you’ll see a box to check that says “Open link in a new tab”. Just check that box and save. Apply the Organic Custom page template to your page. Click the Customize Page button. Select the Organic Feature List widget. Give your Feature List section a title and description. Give the button a title (Button Text field). Copy & paste the button link URL (Button URL). Select a Number of Columns. Add a Feature Title for each list item. 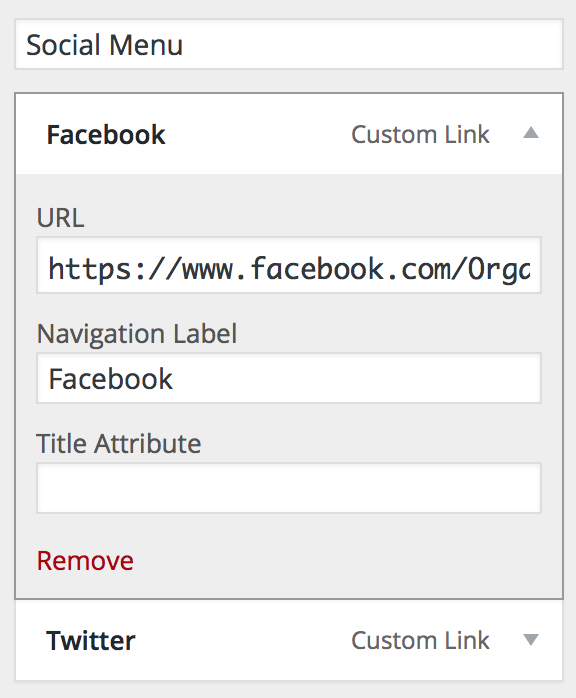 You can add a link to the feature title by copy/pasting a URL within the Feature Link URL field. Click the Select Icon button to choose an icon, or click the Custom Icon Image/Select Image button to upload your own custom icon. Add text content for each item within the Feature Text field. Customize Section Background Options as desired; click the Apply button. This is an example of an Organic Featured List section with 3 columns applied. Select the Organic Portfolio widget. Give your Portfolio section a title and description. Complete the remaining fields, as desired (Max Number Of Posts, Number Of Columns, and Section Background Options). Here is an example of an Organic Portfolio section. An Organic Pricing Table widget allows you to display your products within a clean, simple table format. Add a Title and description for each item. Add a title for the button within the Purchase Button Text field (ie: “Buy Now”). Copy & paste the button link URL within the Purchase Button URL field. Add Text Row items (such as product features) as needed – add as many as you like! You may also add a Background Color for your Pricing Table section. This is an example of an Organic Pricing Table section. The Organic Subpage widget displays a section of content from another page on any page. Apply the Organic Custom page template to the page you want to use. Select the Organic Subpage widget. This is an example of an Organic Subpage section.